The phrase “cherry on top” makes me think of an ice cream sundae or something sweet like that. As for me personally, I have never cared for the preserved red cherry on top, but I do enjoy fresh cherries immensely. Besides the obvious Christian theme, maybe that is what this picture is about. Enjoy and here is the official definition for the phrase according to the Oxford dictionary. “A desirable feature perceived as the finishing touch to something that is already very good.” Fits this picture very well, don’t you think. This is what I saw when I first came into the City of Philadelphia on a pleasant train ride that took me through the Amish country of the southeastern part of the city. After arriving at the Amtrak station I went to Suburban Station and emerged into the realm of high buildings and intense sunlight. From here I made my bus connection out to the Chamanoix Mansion, a classy hostel located near one of the city’s large urban parks. Here is a picture taken on a very hot afternoon on a June afternoon that I have dubbed “The Blue Air Conditioner”. I don’t know how some people, including myself, would survive the sometimes torrid heat without this nifty electronic cooling device. Sometimes, surviving city life takes lots of creativity and ingenuity. Planting trees and painting walls are two activities that can make a place more livable, though this image may lead people to think otherwise. Philadelphia is full of contrasts. Here are two different styles are architecture. This past Saturday I had the privilege of visiting the charming Southern city of Savannah, Georgia. The occasion was the 4th Annual Savannah Book Festival, which was held at Telfair Square in the old historic district. Here in the historic district of the city, organizers had arranged literary speakers to give talks not only at the above pictured Telfair Museum, but also at the Trinity Methodist Church, Jepson Museum and a tent that was set up on the public square. Also on the square were a couple of book tents, where visitors could purchase both fiction and non-fiction titles. Besides from the gathering of readers and writers, there was also the walk through the old city from my streetside parking spot to the festival site. This stroll was most informative, for it took me right through one of the largest historical districts in the country. Savannah has a most interesting history for it was built in the early years of the 18th century to give British debtors, a second chance in life. To understand Savannah, it is necessary to take a look at the city’s founder, James Oglethorpe, a British citizen, who was born in 1696. James Oglethorpe served in Queen’s Anne War, returned home and was incarcerated in a British prison for killing a man in a brawl. After five months of confinement, Oglethorpe was released from jail and immediately elected to Parliament. His prison experience became paramount it the man’s successful attempt to recommend changes for the system. Of utmost concern was the British custom of imprisoning those who went bankrupt. Savannah, which was begun as a British settlement in 1733, was created to give those imprisoned for debt a second chance in life. From this unusual beginning arose a prosperous city, which has survived the tests of time, and remains an important place of commerce today. You don’t need a big room like this to enjoy reading, yet there is something very conducive, perhaps even seductive, about an airy library space that entices the book browser to sit down and enjoy an extended period of quiet and intellectual stimulation. Quiet reading places can be usually be found at home, but use of a public place to sit down and absorb an engaging piece of literature is also very rewarding. 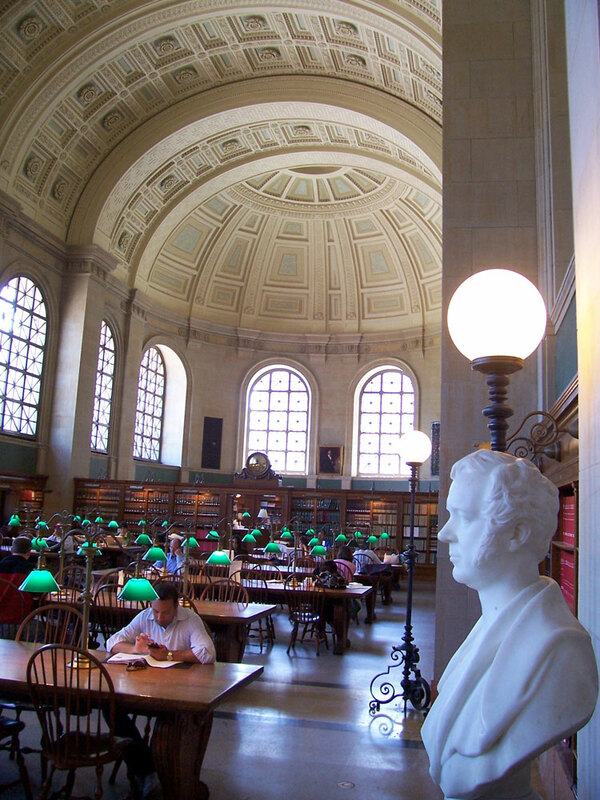 Both Boston and New York have excellent public library systems, each with their own late 19th century edifice that is worth a visit just to admire the exquisite architecture and interior design of each place. When in New York be sure to check out the Rose Room on the second floor of the library at Bryant Park. With an elaborate wood decor and heavenly murals placed across the ceiling, this vast space is like the Sistine Chapel of US libraries. Besides the exquisite Reading Room the Boston Public Library has a pair of lions and and several gallery spaces are worth checking out, plus a fancy restaurant called Sebastian’s. All in all, it is a great space to spend a few minutes or the whole day. Bookstores, although not as ornate, still can provide a rich experience for those who like the idea of having a printed word or image that has been printed on paper and bound within a soft or hard cover. Of course, the idea is to purchase a book and take the reading material home. How these institutions will survive the growing phenomena of the e-books is beyond me, but I do enjoy visiting the brick-and-mortar merchants and bringing home a new book. New York Library as seen through the trees at Bryant Park. In retrospect, anyone visiting NYC or Boston ought to check out these institutions along with the adjoining plazas and park areas. In the process you will learn much the creation of both interior and exterior public space in two of the Northeast’s most important cities. I had the pleasure of riding the Greyhound bus from Montreal to New York City and then continuing my journey to South Carolina, where I will spend the holidays. 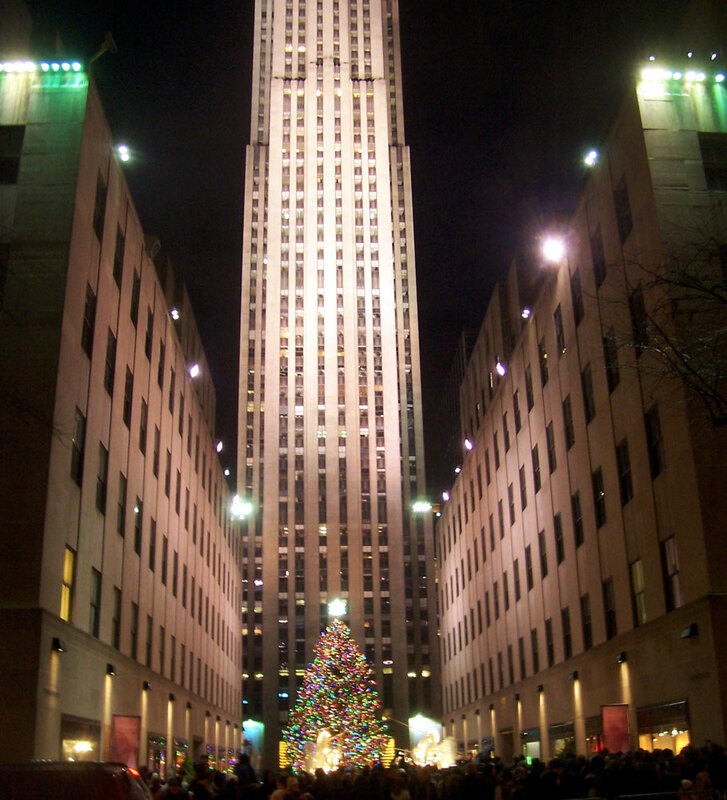 Fortunately, I was able to squeeze a twelve-hour stopover in the “Big Apple”, where I got to partake in a busy December Saturday, when everybody was out and about. Many were Christmas shopping others were just enjoying the sunny weekend day. First stop for me was the grand ole library at Bryant Park. This landmark city building was jam-packed with visitors and users. An exhibition concerning the origin of three major religions (Islam, Judaism and Christianity) from one small region of the world (the eastern edge of the Mediterranean) was the big attraction, but the spectacularly high and ornate ceilings of the Rose Room attracted many sightseers as well as regular users. 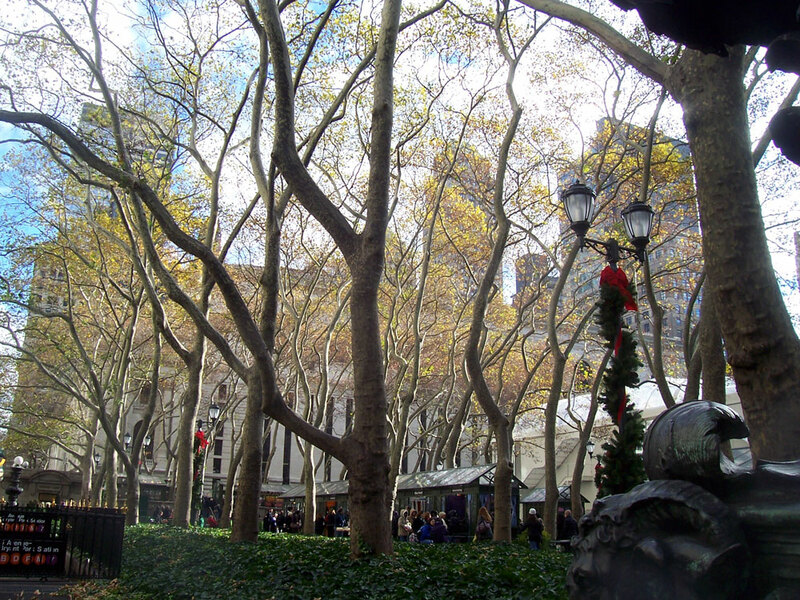 Outside the massive limestone walls stood Bryant Park. The ice rink was filled with skaters, who struggled to navigate their way through the mass of humanity that was out on the ice. The rest of the tree-lined park was home to a myriad of artisans, who had their works out on display for all to see. From the Public Library I boarded the subway and headed downtown to the Soho area. Next, came a visit to Katz’s on Houston Street for lunch, but a line ran halfway down the block from the front entrance, discouraged a visit to this well-known eatery. Instead, a couple of slices of pizza and a Mexican beer at nearby Ray’s was my lunchtime repose. 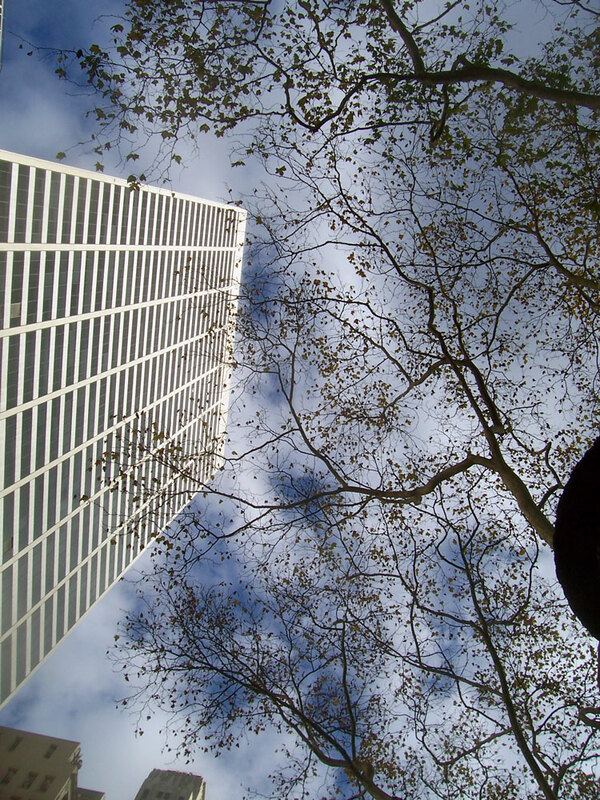 More wanderings took me further south where soon I was strolling at the base of the Wall Street tall towers. This is the lower section of tall towers, where the once majestic WTC once stood. This conglomeration of tall towers is located a good distance away from midtown Manhattan, where such giants as the Empire State Building, Pan Am building, Rockefeller Center and Chrysler Building form the rocketing skyline. The Brooklyn Bridge was a popular walkway, filled with pedestrians despite the cold winds that carried across East Bay and the East River. As dusk approached the partially-clouded sky created dramatic lighting that filled the western sky. Even with the great view, I was still happy to arrive back on solid land, where I could seek shelter from the wind at one of the many small coffee shops that frequented the Wall Street area. By the time I reached the Staten Island Ferry Terminal at the tip of the island, darkness had set in. Even so the huge metal and glass atrium was filled with a mass of humanity, all waiting for the arrival of the large metal transport. The crowd of a thousand plus people packed into the vessel with ease and quickly departed the dock for the short crossing. 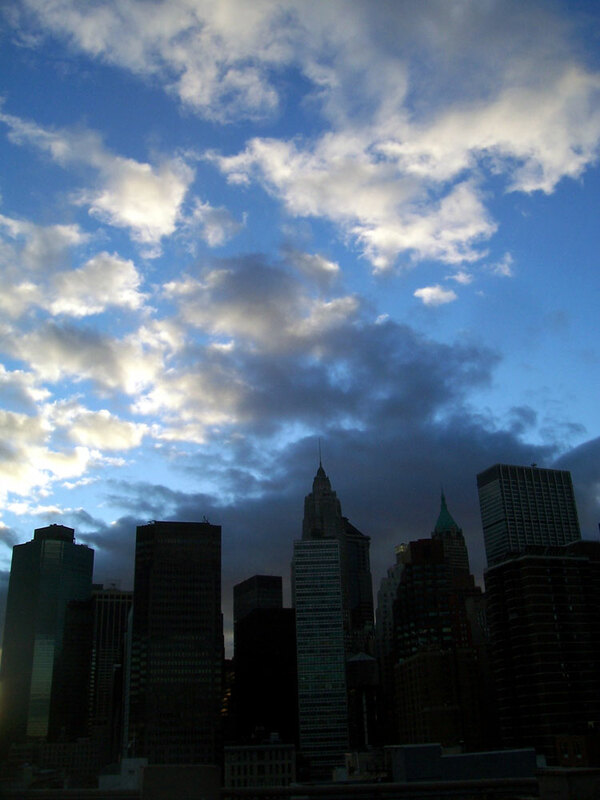 I stood at the rear deck of the boat watching the Manhattan skyline recede into the distance. With the bow of the ship acting as a windbreaker the ride was much warmer than my walk upon the Brooklyn Bridge. Upon my return to Manhattan I went underground and rode the subway to Rockefeller Center, which now had a large skating rink and Christmas tree installed at its base. 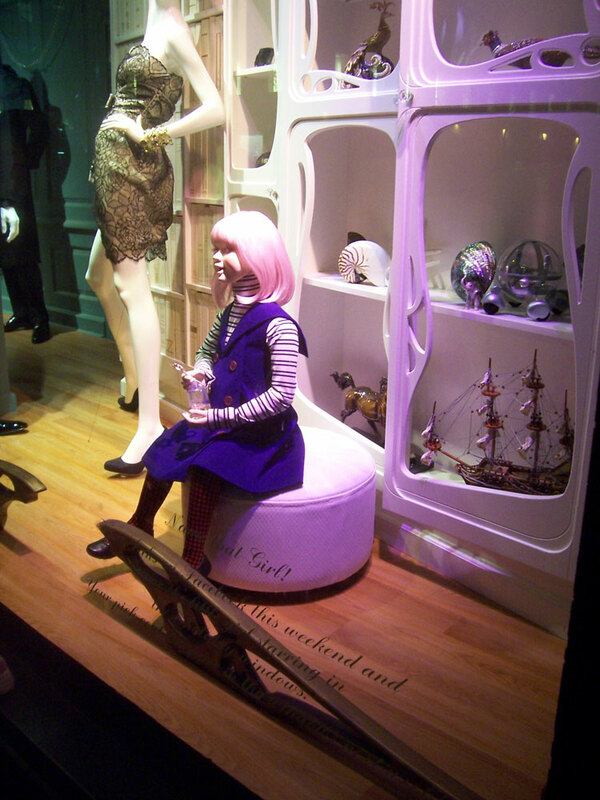 However, the biggest attraction was the window displays at Saks Fifth Avenue and Macy’s. After cruising by the glowing windows one last walk awaited me. Although by this time the night had become quite cold and windy, the neon marquees still lit up the night with their colorful messages. 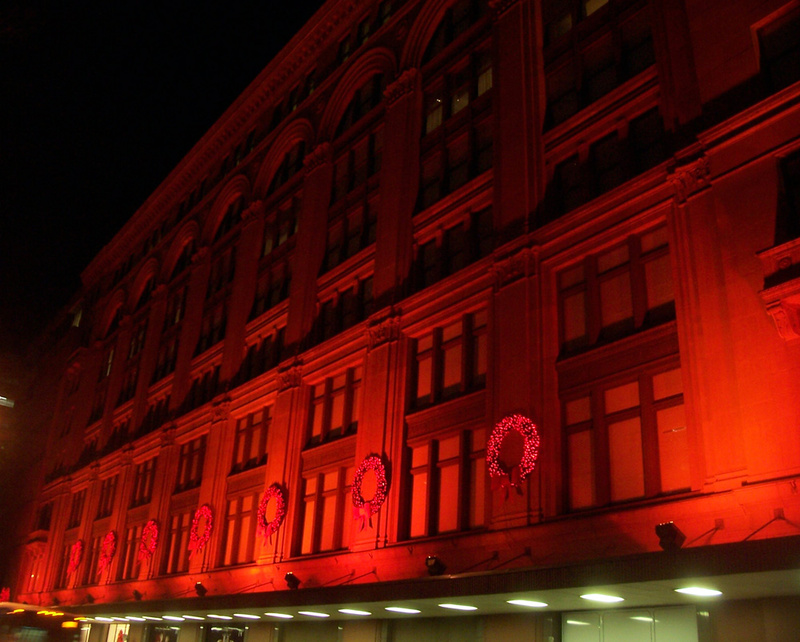 Finally, I entered the confides of the port Authority Building where it felt good be out of the cold. All in all it was a busy 12 hour break from my overland journey. Our first snow fell today in Montreal, leaving two to three inches of the white stuff all over the city. The extra few degrees of cold temperatures is a bit of a shock, to the system, but the snow looks very stately as it fills the city parks and covers the cars. However, the wind that whips down the cold canyons in the downtown area takes some getting used to, for it chills your right down to your bones. Actually, a warm-up is on the way, but that means all the snow will melt. Life is finished trade-offs, even among the little things. My departure date from Montreal back to the states is getting nearer everyday. It is not an event that I wish to undertake, for I would be quite happy remaining here at the border of French-speaking Canada. I like the metropolitan area, especially the abundance of art which can be seen everywhere, such as the mural on the side of the building that is the subject of the photograph. 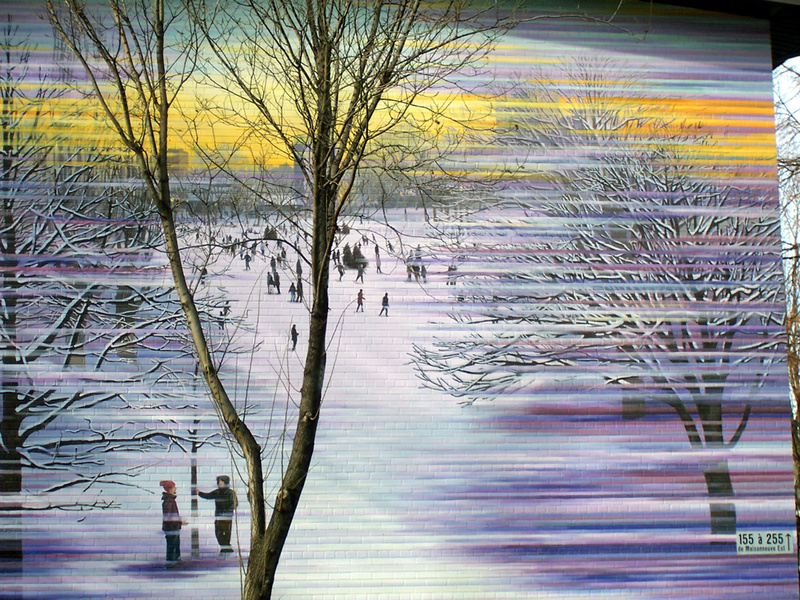 Take a close look at the tree in the foreground of the picture, for it is not part of the painting, but a real tree growing on the street. Still, my departure my Montreal has a good side to it, for I will be in warm and sunny South Carolina for December and January. I’ll still miss the friendly city.